Iron Wolves Featherweight standout Neil Broadbent just secured his second straight submission victory after returning from a long injury layoff after his fight with Dinky Ninja Graham Connelly. He locked up the head and arm Guillotine and got the tap in 44 seconds, 10 seconds slower than his last fight. You're slowing down old man. 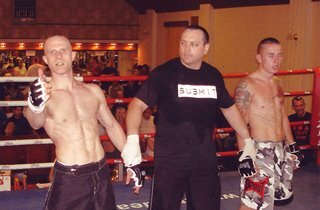 This fight happened on Fight Factor, on Saturday 25th.